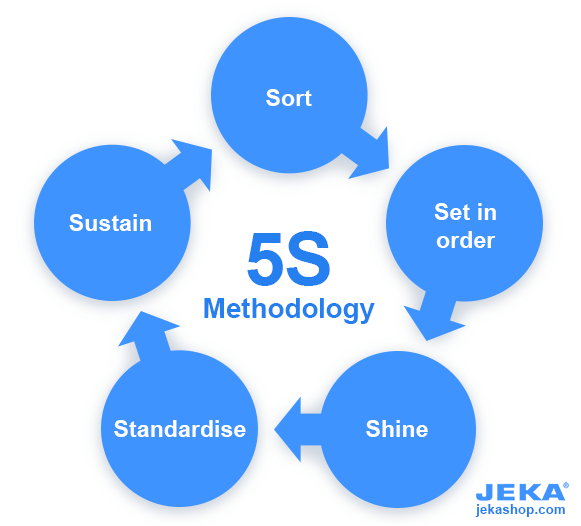 The 5S methodology stands for efficient, effective and safe work. The 5S model, a Lean manufacturing method, is focused on the work place and each step contributes to more effectively organising processes within a company. In this step, differentiate between objects in the workplace that are necessary and those that are superfluous. All superfluous objects, such as damaged or rarely used objects, should be removed from the workplace. Now, you can set everything in order. This means all objects are assigned a designated place and will be put back or stored in the designated location. This way everyone can quickly and easily find what they need. Therefore you could use floor tape or barcode labels. Shining means cleaning everything at and around the workplace. For example, the walls, floors, machines and tools. A clean workplace is vital. Standardising ensures the three previous steps are maintained. This is done by setting rules, procedures and standards of which everyone is notified. Sustaining refers to maintaining the 5S model. This can be done by periodically checking whether the established agreements are still being adhered to. An additional sixth ‘S’ is often added: safety. This ensures workplace safety to prevent accidents and injuries. The 5S model was devised for manufacturing, but is also applicable in offices, logistics and healthcare. Our floor markings are particularly suited to the implementation of the 5S method. Thanks to the large variety of colors and shapes, work environments can be designed to be efficient, effective and safe.